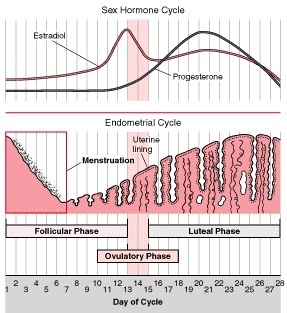 Let's take a look at your menstrual cycle as you move through the month. The following ovulation calendar is based on a 28 day cycle, so if your cycle is a bit longer or shorter, please adjust accordingly (for some help here, visit our online ovulation calendar). We take you through your cycle day-by-day and interject a few points and tips (like when to start ovulation testing or how to interpret changes in cervical mucus - a natural fertility symptom). Get Pregnant Tip #2 Start Fertility Chart: A fertility chart will be the cornerstone of your trying to conceive efforts - a daily ovulation calendar where you record your fertility signs, your daily basal temperature (more on that below), the results of ovulation tests or fertility monitors, and when you made love. 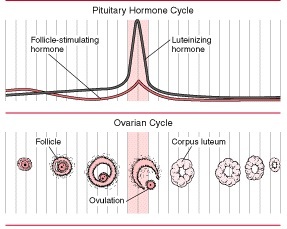 A fertility chart will help you predict when you ovulate - your most fertile time to get pregnant. -- We had trouble conceiving and it was shocking news. When we found out in-vitro fertilization would most likely be our only chance for success, our anxiety grew. But, with the help of my husband's amazing insurance, after three cycles, we were able to have our daughter, Ella. And after three more cycles, our twins Logan and Mia graced us with their presence and we were truly blessed. I know that we were one of the lucky couples. Many people can't afford one IVF cycle, let alone six. And, I've never taken that for granted. After my daughter was born, I started writing Ordinary Miracles. I wanted to share my story with others because I remember hearing success stories when I was in the midst of my struggle, and it inspired me to believe if it could happen to them, maybe, it would happen for me too. After my twins were born, I started my blog: Stress-Free Infertility. I wanted a place on the Internet where couples could go to and read about others, get solicited advice, and be inspired by other success stories; a place to ease the stress of infertility, at least a little bit. Start reading Ordinary Miracles on your Kindle in under a minute!